The Dubai Duty Free Championships had begun with a string of one-sided results and bakery products. The first of Tuesday’s night matches finally produced a three setter and with that, the best match of the tournament; Jelena Jankovic won just her third match of the year so far, coming from a set and a break down to defeat last week’s St. Petersburg finalist, Belinda Bencic, 4-6 7-5 6-4 in two hours and 31 minutes. It was a really entertaining match and well worth a watch back if you’re pondering which match to catch up with from Dubai! Bencic was very composed during the first set and didn’t face a break point on her serve, winning it, 6-4. As the match wore on, the composure faded somewhat! In her first service game of the second set, Bencic began to look a little tired… and understandably so having played Fed Cup two weekends ago and then heading straight into St. Petersburg where she played four matches. Bencic would stave off break points in that game to keep in touch. Against the run of play, Bencic got the first break of the second set with a really positive and aggressive game; however, she couldn’t back it up with Jankovic responding with an equally aggressive game and going on to win the next eight points to lead 5-4. Bencic’s temper began to boil over; while she navigated past the first challenge of serving with scoreboard pressure, she eventually succumbed in a thrilling game at *5-6 where Jankovic took the set on her sixth set point. Bencic was so emotional on the changeover and had a heated chat with her father. I didn’t know what they saying but at the end I got the impression he said something like “just snap out of it!” as he promptly stormed off back into the stands. Bencic had looked, dare I say, calmer in some of her matches this year but she was visibly frustrated, perhaps stemming from tiredness due to such a heavy schedule of late. Bencic should have broken in the first game of the third set but missed a makeable backhand on her third break point. The set went with serve right up until the end. Jankovic was always the one in control and looked the fresher with Bencic clearly struggling. Despite the impressive fight with Bencic producing some wonderful tennis with her back against the wall, saving seven break points across two service games, it wasn’t enough. She fell to her knees in anguish after another bruising point and Jankovic secured the victory on her first match point. It was a super win for Jankovic and while she was not exactly clinical, converting just three out of 17 break points throughout the entire match, she was good value for the win. Her backhand down-the-line is still such a precious shot. Jankovic’s continues to show off a vastly improved serve and she dropped just eight points on her first serve in the second and third sets. I wish Jankovic had had this serve when she was at the top of the game because I do honestly believe she would have won a Slam with it. For Bencic, she needs the rest. I love how she always gives such heartfelt handshakes, even in this case, when she was in tears at the end. Unfortunately, this loss snapped a 16-match winning streak in three setters for Bencic! Haaa..I think Bencic needs to lose some weights. Well done Jankovic. These two last met in Indian Wells in another three-setter which Jelena won; she reached the final of that tournament, losing to Simona. For me it’s good to see Jelena having a bit of an “Indian Summer” in what must be the autumn of her career – she won two titles in the “Asian Swing” last year and reached the 4th round in Wimbledon, her best performance there ever. As James says Belinda’s been playing a lot of matches recently and it’s quite likely she was feeling the effects of this. It’s a fun match-up, their match in Indian Wells was also entertaining. They also met on grass in ‘s-Hertogenbosch last year which BB won in straight sets. 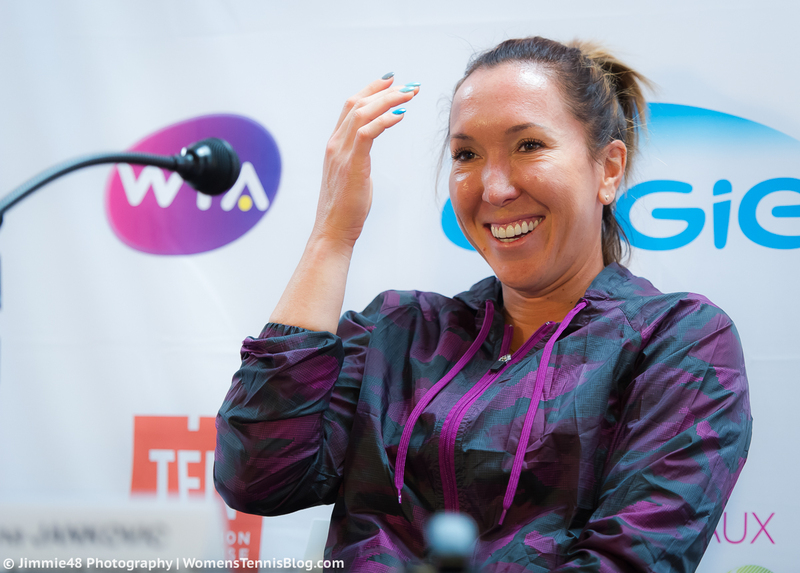 I’m glad to see Jankovic picking up some wins, she’s such an asset to the tour and she’s great to have around. Bencic could do with the rest and hopefully should be good to go for Doha next week. Regardless of the outcome of this match if Bencic wants to take her overall game to the next level,she needs to address her ‘Serve’ ASAP especially her 2nd serve.I have been saying this for some time.Also her overall movement needs improvement.In regardsl to her ‘on court behaviour’ it leaves me cold quite frankly.I must say I have ‘never warmed to Bencic’,though she does have tennis skills. Belinda definitely needs to improve and has loads of time to do so. There’s no pressure to win slams and be #1 at 18 and the world of WTA doesn’t really go that way any more. These days the competition is fierce and it’s not a game of skills alone any more. It’s a game of mental and physical strength, with players getting way more matches and tournaments in a year. These days coaching and management has become vital to a player’s results and development, much more so than before and it’s the reason why a hugely talented player like Serena can still play so damn fine and still rank #1 despite taking months away to rest and recover at times. Good choices and management. On topic: I’m going with JJ on this. I feel she’s more motivated. I do think Belinda has a lot of potential and more importantly great drive/motivation. As we’ve seen with Vinci and Jelena, she doesn’t have an out and out weapon and when better opponents with similar styles to her come to play she finds it challenging. Her serve is attackable and I wonder why alot of the hard hitters are not patient enough against her to take advantage of it. Time will tell if she can make her game more durable, she is exuberant which I like. Good post James. One thing I like about Belinda is that with her, whatever happens on the court stays on the court; when the match is over she’s happy to share a smile and often a hug or a kiss with whomever she’s played against. I’d say that if her game has a weakness at the moment, it’s her return of serve against big servers rather than her own serve; Maria was making aces off even her second serve against Belinda when they played in the AO last month, and she was the returner when Sabine Lisicki hit 27 aces in a match in Birmingham last year. I agree about Jankovic too; she’s a real character and from what she’s said is happy to still be out there playing rather than defining herself by whether or not she wins a big title like a Slam (though she still says it’s her “dream” to win one). When I looked at the stats for the end of 2008-89, I was surprised to find that she was No.1 by a big margin (nearly a thousand points) over Serena, at a time when there weren’t as many ranking tournaments as there are now. BTW, you were right about Hertogenbosch; apologies for the mistake, I’ll try to check Matchstat or something similar before commenting on players’ past records in future.